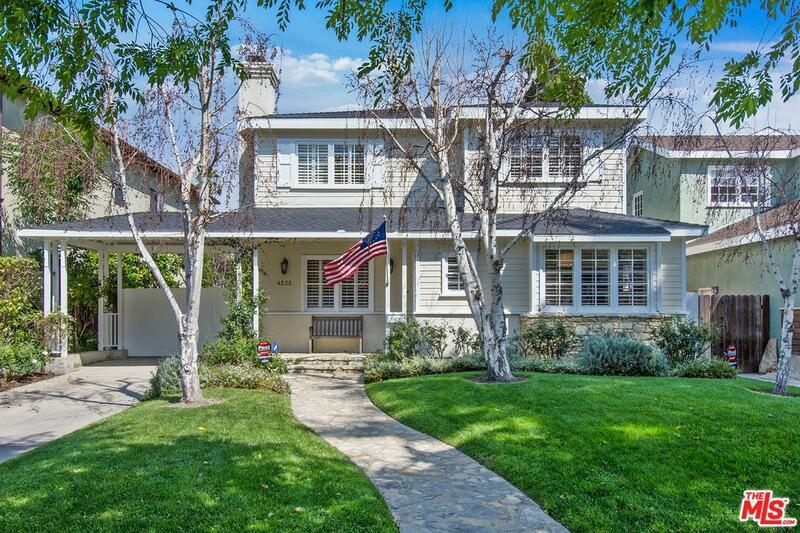 This graceful remodeled two-story home is within the highly desirable "Footbridge" neighborhood of Studio City and the award-winning Carpenter Charter Elem School district. Originally designed by famed architect Richard Olander, this stunning retreat offers 4 beds, 3 baths, a fab det guest suite/pool hse/studio w updated 3/4 bath and saltwater pool. An open chef's kitchen w Viking appl, custom cabinetry, Caesarstone counters and farmhouse sink adjoins to family room, w built-ins and french doors leading to lush entertainer's backyard; an outdoor kitchen, flagstone patio, pergola, and saltwater pool w new retractable safety cover. An elegant living room, spacious DR, wood floors, and a 4th en-suite bedroom complete main level. Upstairs are two beds, full bath and striking Master suite w walk-in closet, luxurious spa bath and french doors onto patio w backyard & pool views. Other features include custom window treatments, solar panels(leased), dual-zone HVAC, gated drive + porte-cochere. Sold by Andrew Rhoda BRE#01241732 of Compass. Listing provided courtesy of Matt Fonda DRE#01241732 of Coldwell Banker-Studio City and Jeffrey Mcmahon CA DRE# 01915484 of Coldwell Banker Residential Br.